Her message of economic populism resonates as she stumps for Democrats, with more events this week. CAMBRIDGE, Mass. — Sen. Elizabeth Warren is quickly becoming a top Democratic fundraiser and campaign powerhouse, hitting the road on behalf of candidates in key races that the party will need to win to retain control of the U.S. Senate in November. Since March, the Massachusetts Democrat has stumped for candidates in Ohio, Minnesota, Oregon, Washington and Kentucky, and she has trips planned this week for West Virginia and Michigan. It’s a hefty schedule for a freshman senator who not long ago was teaching law at Harvard. Along the way, Warren has found her brand of economic populism resonating far from her home in the liberal enclave of Cambridge, Massachusetts. Part of Warren’s economic pitch is legislation she sponsored that would let college graduates refinance their student loans at lower interest rates, an effort blocked by Senate Republicans. 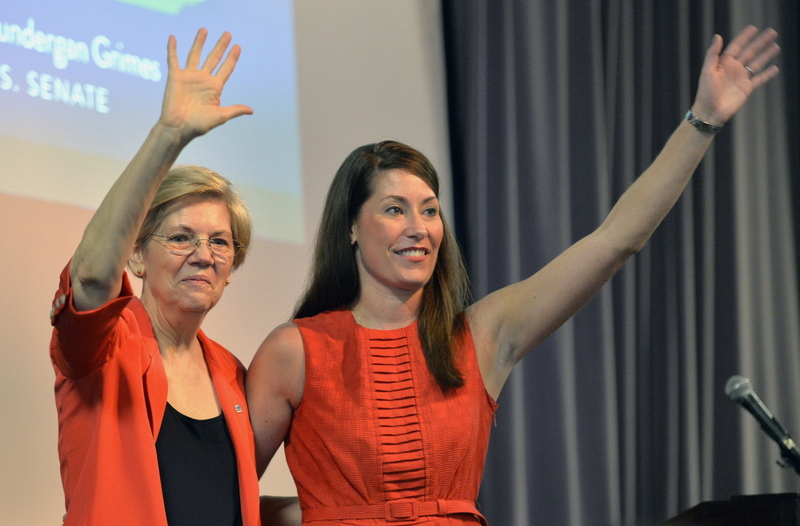 Warren found a receptive crowd during a recent campaign stop at the University of Louisville with Alison Lundergan Grimes, the Kentucky secretary of state hoping to unseat Senate Republican Leader Mitch McConnell. “When you’ve got a choice between billionaires and students, Mitch McConnell says it is more important to protect the billionaires,” Warren told the crowd. Senate Republicans blocked Warren’s student bill last month on a 56-38 vote that fell short of the 60 needed to advance the proposal to a debate. McConnell had criticized Warren’s bill when it came up for a vote, saying it won’t make college more affordable or reduce the amount of money students will have to borrow. Cast by critics as a typical Northeast liberal, Warren, 65, grew up in Oklahoma in a family which she said lived on “the ragged edge of the middle class” – an experience that she said helped forge a lifelong interest in advocating for working families trying to get a fair deal in an economic and political system that Warren argues is rigged against them. Warren found herself thrust into the national political spotlight during a grueling 2012 campaign against incumbent Republican Sen. Scott Brown. It was the most expensive campaign in Massachusetts history, with both candidates raking in tens of millions in donations. Warren’s profile has made her a go-to campaigner for Democratic Senate candidates, in part because as a newer arrival on the political stage she is free of some of the political albatrosses carried by other top Democrats like President Obama or Hillary Clinton. Warren is continuing her fundraising efforts with a planned Monday event with West Virginia Democratic Senate hopeful Natalie Tennant. Tennant, West Virginia’s secretary of state, is vying with U.S. Rep. Shelley Moore Capito for the seat held by retiring Democratic Sen. Jay Rockefeller. Capito is favored and holds a hefty cash advantage. Later in the week, Warren is scheduled to attend a fundraiser with Michigan Democratic Senate hopeful Gary Peters, who is facing off against Republican Terri Lynn Land. Peters and Land are competing to replace Democratic Sen. Carl Levin, who’s also retiring. Julian Zelizer, a political history professor at Princeton University, said Warren is crafting a national political profile while also testing whether a populist economic message can win broad support across the party.